It’s clear that rather than attempt to beat Amazon at its own game, the Kobo Mini is designed to fulfill some needs that Amazon is ignoring. It’s perfect for those who find Kindles too large or heavy to hold comfortably (children perhaps?) or even too expensive. Furthermore, it’s literally pocket-sized, which is something that might appeal to those who want to carry an e-reader around without the need to take a bag along too. The battery isn’t quite as impressive as a Kinles’ surviving a couple of weeks without Wi-Fi enabled but that’s still a solid length of time. The 2GB capacity rivals the Paperwhite, if not the Kindle 5. The battery isn’t quite as impressive as a Kinles’ surviving a couple of weeks without Wi-Fi enabled but that’s still a solid length of time. The process of buying and reading books is simple, but it’s a slight irritation that you can only transfer books from your PC using the USB cable. Kindles allow you to email documents, and the lack of this feature from the Kobo platform is a disappointing omission that has the potential to cause inconvenience, given that there are no alternatives. That said, Kobo devices natively support the popular ePub format, which the Kindle does not. Aside from the form factor of the Mini, the benefits of Kobos are found in their more open and transparent platform. Whether that’s enough to draw you to it is debatable. The selection of books is good, but it isn’t as good as Amazon’s. The software is fast, but it’s not as fast as Amazon’s. It’s always second, at best. It’s no surprise, then, that a device like the Kobo Mini exists. However, the only way it can compete with Amazon is to try and sell itself to people who don’t want a Kindle, whether that’s due to ideological reasons, its size or financial limitations. The Kobo Mini is a decent e-Reader; the only problem with that assessment is that you don’t’ have to travel very far to trip over a great alternative. A fair attempt, but the Kobo Mini is only worth considering if you want it for its reduced size or low price. 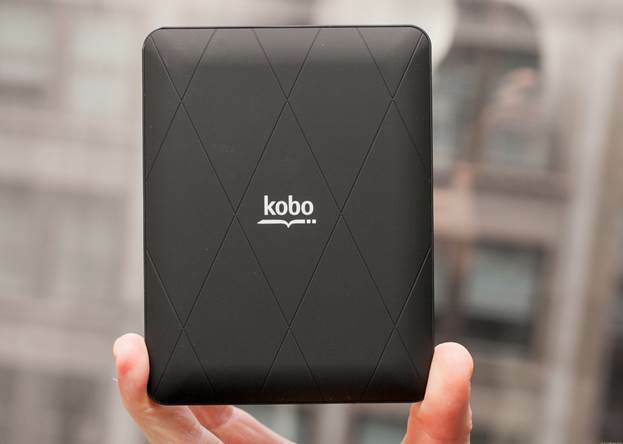 At the opposite end of the spectrum to the Kobo Mini is the Kobo Glo. Where the Mini has been aimed at a market neglected by Amazon, the Kobo Glo is positioned as an obvious competitor to the Kindle Paperwhite. A foolhardy quest, perhaps, but one with the potential for great rewards should it is successful. Like the Paperwhite, the Kobo Glo is an e-ink touchscreen with a built-in light. Like the Paperwhite, it’s entirely touch-controlled; leaving the exterior clean and unsullied by buttons, save for hardware on/off switch for the light. Also like the Paperwhite, it’s more expensive than its vanilla version the Kobo Touch. Notably, that price is tenner cheaper than the Paperwhite, but the lower price means you get a battery that lasts only two weeks (with Wi-Fi deactivated) and no opportunity for provision of a 3G connection. Unlike the Paperwhite, which uses a proprietary illuminating layer, the Kobo Glo uses more traditional edge-lit LED illumination similar to old LCD monitors. The results are interesting, though not particularly impressive. The screen’s lighting is more even and uniform than the Paperwhite’s, but with some glare as well. It’s a different, rather than better, approach that solves one problem while introducing another. We’re not certain there’s enough in it to make a fuss over, but the Paperwhite’s screen ultimately looks that little bit better while reading. One thing we are certain of is that the light’s on/off switch is a little too small to use comfortably, and it takes a good push for you to actually switch it on and off. The Paperwhite manages its illumination in software, which provides a far better user experience. At least the touchscreen on the Kobo is as easy to use and responsive as any other device. One thing we are certain of is that the light’s on/off switch is a little too small to use comfortably, and it takes a good push for you to actually switch it on and off. Unsurprisingly, the platform is the same as that found on the Kobo Mini, with all the benefits and flaws that entails. There isn’t a huge gap between this and its main rival, but ultimately the practical considerations (such as a shorter battery life and mandatory PC connections) make the slightly cheaper price seem like a poor incentive to buy into the system. It’s not enough for the Kobo Glo to be a little bit cheaper: it needs to be definitively better as well. Put simply: it isn’t. The Nook is well-known in the US due to its association with the huge bookseller, Barnes & Noble, but as of October 2012 it’s possible to buy one in the UK as well. 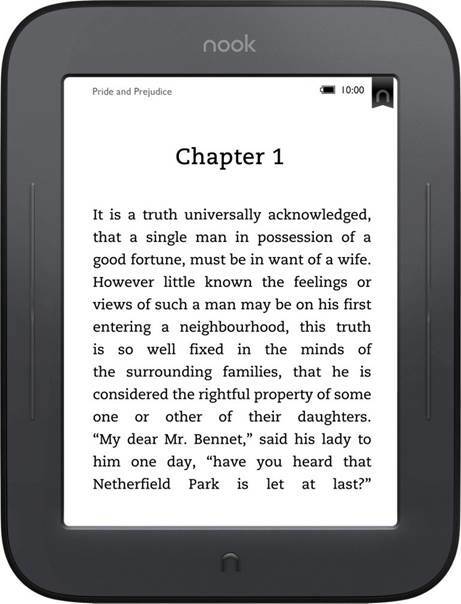 The cheaper of the two models, the Nook Simple Touch, is a basic e-Reader positioned against the generic Kindle. Unfortunately, it doesn’t seem to have noticed that the Kindle 5 has shed $30.2 off its price. Aside from the touchscreen and some small details, the two devices have near-identical features, but nothing here makes it worth the extra- the addition of a touchscreen and the ability to read ePub files isn’t really enough in our eyes. Admittedly, the battery life is more competitive than the Kobo’s, promising around two months without Wi-Fi enabled but what the Nook consistent fails to do is demonstrate that it can do anything better than the Kindle. It’s almost all just as good or worse. Indeed, if a touchscreen means that much to you, the Kobo Mini has one and it’s even cheaper than the Kindle 5. One thing about the Nook that’s definitely a disappointment is the screen’s contrast, which is poorer than almost any other mainstream e-Reader. Somewhat audaciously, the website shows mock-up images which show the screen to have an almost black-on-white appearance. This most certainly isn’t the case with the actual hardware. The only feature that even tries to stand out on the Nook Simple Touch is its MicroSD slot. Nook are one of the few e-Reader manufactures who think users might need extra space, so while the 2GB basic space included isn’t any different to most of the competition, the built-in MicroSD slot allows for an extra 32GB to be added at minimal cost. Obviously, 32GB of books would be a lifetime’s worth, but maybe someone out there has a use for that extra storage. In a very competitive market the Nook Simple Touch isn’t doing anywhere near enough to distinguish itself from the crowd bustling behind him Kindle. At this price, its UK release seems to be a formality more than a good screen, you’re in luck. Otherwise, literally any other e-Reader is better. Everything looks weak compared to the Kindle, but the Nook Simple Touch looks weak compared to everything else, too.